While the acting is good and the drama sharp, Swimming Upstream is one of those films that seems good but slips from the memory after time. It's hard to pin down exactly why this is. Part of this may be due to the unfamiliarity of most Americans to Tony Fingleton, a highly popular Australian swimmer, who, in the 1950s, became one of the top backstrokers in Australia. Fingleton adapted his autobiography, co-written by his sister Diane, and tells his story against the backdrop of an abusive childhood, and the continual search for acceptance from an uncaring father. Even with all of his successes, Tony's father Harold (Intolerable Cruelty, Pirates of the Caribbean) never warmed to his son. As a child, Tony bore the brunt of his father's alcoholic rages. His oldest brother was tough and athletic, while Tony was quiet and preferred to play the piano. The Fingleton siblings would spend lots of time together in the pool, where they could enjoy themselves and forget about other matters. Harold worked at the docks, and wages depended on the overall level of business. Tony's mother Dora (Judy Davis, The Man Who Sued God, Celebrity) loved everybody, but it was obvious that Harold's reactions pained her. Harold only began paying attention to Tony and his brother John after noticing how fast they could swim. He became their coach, believing that he could lead them to victory, and perhaps achieve a level of success with them that he never did as a child. 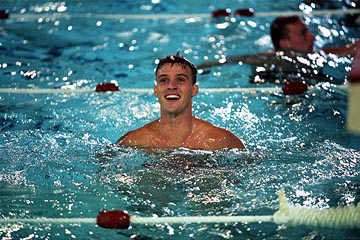 Director Russell Mulcahy (Resurrection, Tales of the Mummy) flashes forward to Tony (Jesse Spencer) and John (Tim Draxl, Dirty Deeds) as teenagers, both up-and-coming swimming sensations. Tony's backstroke and John's freestyle are the talk of the town. Both sons are clearly talented, yet Harold only praises John. His attitude towards Tony is indifferent at best, and this really hurts Dora, Tony, and John. Even as it becomes apparent that John may be the better swimmer, Harold never seems to care, and goes as far as committing an act of betrayal on Tony's part. For Tony, winning turns into two things. If he wins the national championship, he hopes to get some recognition or approval from Tony. In the back of his mind, he knows that this is unlikely, so he can also use winning to get away from his father. Spencer gives an earnest performance, but Mulcahy does have the emotional level get a bit too cheesy as it nears the conclusion. To make the competition scenes more effective, he employs constantly moving split screens that effectively ratchet up the excitement level. This contrasts nicely with the emotionless interaction between the family, particularly Rush's emotionally distant actions towards his son. Rush gives a frightening performance, only because nobody is sure that Harold will do next. He is cold and manipulative and a tyrant. It's a shame that Fingleton and Mulcahy never delved into why Harold acted like he did towards Tony. While Tony's rise to fame was inspirational, a deeper examination of Harold would have made Swimming Upstream a better film. 1 hour, 54 minutes, Rated PG-13 for thematic material involving alcoholism and domestic abuse.